Summer vacation is starting to wind down, and I’m left wondering where all the long, lazy days have disappeared to. I seem to have been rushing around just as much as ever. However, when I have had the opportunity to slow down enough to relax and recharge it has been wonderful, and very much appreciated. I had a group of girlfriends over for a light lunch, and it was glorious to sit out on the deck, sipping a cool beverage, dining on our elegant salad and just loving the company and the day. Place dressing ingredients in a blender and process until almost smooth. Set aside. Drizzle olive oil into a large pan, set over medium heat. Sprinkle the salmon with salt and pepper, and pan fry, 5 minutes on each side or until salmon flakes easily when tested with a fork. Place the greens and basil on individual plates. 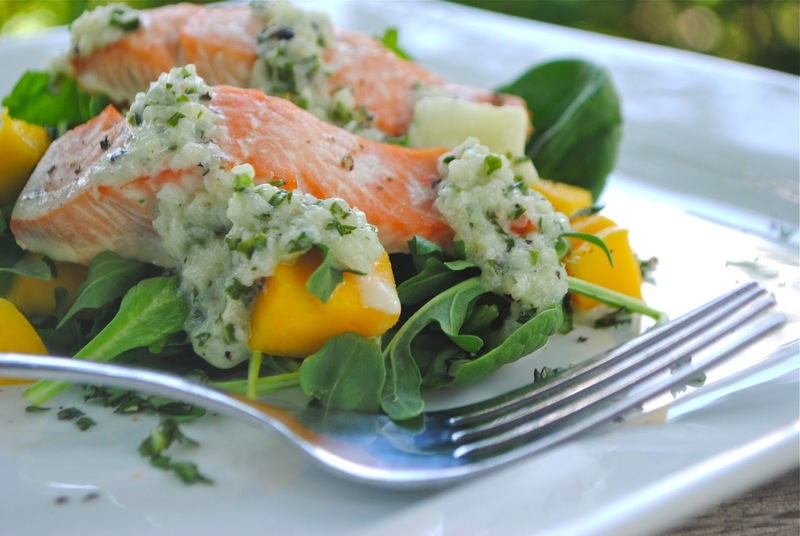 Drizzle with the dressing to taste, and divide salmon among the plates. Top with extra dressing if desired and the cubed mango.